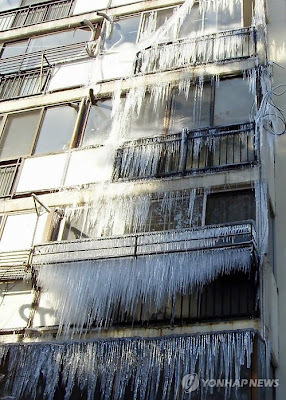 Put some insulation over the water pipes that are exposed in your front or rear verandah at your house tonight, if you live in Korea. 'Cause it's hella cold. The older your building is, the more important it is to follow this advice. Leave your tap adrip overnight, so that the water doesn't sit still in your pipes, and run the chance of freezing. And maybe flush your toilet twice when you wake up in the morning. I usually have to flush twice anyway. I don't know what's wrong with me, I just can't stop eating all those pretzels. have you been drinking anti-reflux baby formula? Because that seems to cause similar problems. Pouring a bag of salt down the toilet is also said to help.